Available from Amazon.com in Kindle version only. This is another Dr. Levine book but this one is aimed towards physicians interested in Peyronie's disease, i.e. wanting to learn more about the Peyronie's disease. 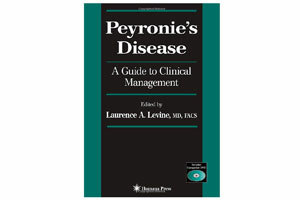 Peyronie’s Disease: A Guide to Clinical Management goes into more details and reviews the current Peyronie's treatment options, both surgical and non-surgical. It also presents various state of the art research techniques. This is a great book for any health professional interested in the Peyronie's disease, or those nonprofessionals that really want to delve into this subject (the text is still very readable though the topic is more complex and detailed).